We made it back home today from spring break in California, and someone was excited to see us. I was being vague about our whereabouts because I didn't want to advertise that the only person at our home was a husky hound. I was afraid someone might take the opportunity to fleece me of my unique collection. I'm a big fan of unicorns and dolphins, and an even huger fan of unicorns and dolphins getting it on. Did you believe me for a moment? I know I am weird, but unicorns and dolphins in the heat of the moment is not my thing. Anyway, Tanklin wasn't alone as we had someone watching him while we were gone, but I still don't want people to know that. There are weirdos on the Internet. 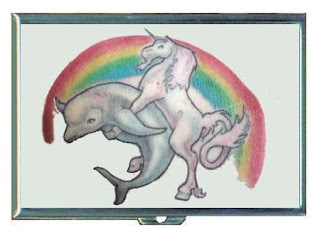 I believe the above picture of the unicorn and dolphin proves that beyond a shadow of a doubt. The only thing missing in the picture is an ambushed paddington. Thanks for stopping by. Take care. Talk to you tomorrow. You're wise to keep some knowledge to yourself. I bet Tank was glad to see you back, though. We'll be leaving our little dog for the first time this coming weekend and I'm sure he'll be fine. There's nothing like being welcomed back home by a dog that missed you. So that's how narwhals came into being, the union of dolphins and unicorns.